The Australian Transportation Safety Bureau (ATSB) published the final report of their investigation into the fatal Embraer 120 loss of control accident at Darwin, Australia. The airplane crashed during a simulated engine failure on takeoff. 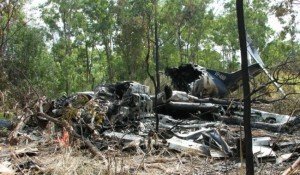 On 22 March 2010, an AirNorth Embraer 120ER Brasilia aircraft, registration VH-ANB, crashed moments after takeoff from runway 29 at Darwin Airport, Northern Territory, fatally injuring both pilots. The flight was for the purpose of revalidating the command instrument rating of the pilot under check and was under the command of a training and checking captain, who occupied the copilot’s seat. The takeoff included a simulated engine failure. Data from the aircraft’s flight recorders was used to establish the circumstances leading to the accident and showed that the pilot in command (PIC) retarded the left power lever to flight idle to simulate an engine failure. That introduced a simultaneous failure of the left engine and propeller autofeathering system. The increased drag from the ‘windmilling’ propeller increased the control forces required to maintain the aircraft’s flightpath. The pilot under check allowed the speed to decrease and the aircraft to bank toward the inoperative engine. Additionally, he increased power on the right engine, and engaged the yaw damper in an attempt to stabilise the aircraft’s flight. Those actions increased his workload and made control of the aircraft more difficult. The PIC did not restore power to the left engine to discontinue the manoeuvre. The few seconds available before the aircraft became uncontrollable were insufficient to allow ‘trouble shooting’ and deliberation before resolving the situation.